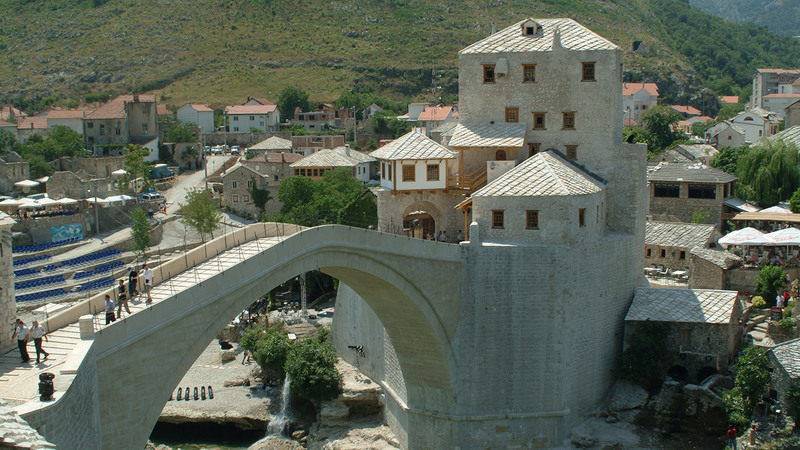 On the 23rd July 2004 the reconstructed Old Bridge in Mostar was opened in front of 10 heads of state, including the President of Bosnia- Herzegovina, Sulejman Tihic and the UNESCO Managing Director, Koïchiro Matsuura, representing the United Nations. Destroyed by grenades in 1993 during the war in Bosnia and Herzegovina, the Old Bridge was the symbol of the city of Mostar. Its destruction struck the city to the heart, as Mostar and the bridge were inseparable. Even the city's name "Mostar" comes from the word “most”, which means bridge. Ever since it was constructed, between 1557 and 1566, by the Ottoman architect, Mimar Hajruddin, the bridge has resisted invasion, natural calamities and wars. All the way up until 1993. Flanked by two fortified towers, the Halebija Tower on the right bank and the Tara Tower on the left, the bridge has a single humpback span, four metres wide and thirty metres long, and consists of 456 white stone blocks. Just 4 months after the bridge's collapse, Unesco launched its first appeal for funds to rebuild the bridge. In addition to establishing guidelines for peace in Bosnia – Erzegovina, the Daytona agreements, signed in December 1995, also stipulated the creation of a commission for the conservation of national monuments and appointed the UNESCO Managing Director to run it. In July 1998, Unesco, the World Bank and the municipal authorities launched an appeal for funding to rebuild the Old Bridge that was answered by 5 countries (Croatia, France, Italy, Holland and Turkey) and the Council of Europe Development Bank. After two years of scientific and archaeological research, reconstruction began in June 2001. The Old Bridge was rebuilt with local, "Tenelija" and "Bretcha" stone taken from nearby quarries and quarried using traditional methods such as quoins, clamps and pins. In April 2004 the bridge was completed. In addition to the bridge, Unesco has sponsored 4 other projects in Mostar: the restoration of the Tabacica mosque (at a cost of 200,000 dollars financed by Saudi Arabia); the regeneration of the historical centre of Mostar (at a cost of 230,000 dollars financed by Italy); the restoration of the Kriva Cuprija bridge (at a cost of 100,000 dollars financed by the Grand Duchy of Luxembourg) and the renovation of the old Mostar hammam (at a cost of 150,000 dollars financed by France). At a total cost of 15.4 million dollars, the project was financed by a loan from the World Bank (4 million dollars) and contributions from Italy, Holland, Croatia and Turkey. The European Union and the French Government also provided technical assistance. The city of Mostar provided 2 million dollars. 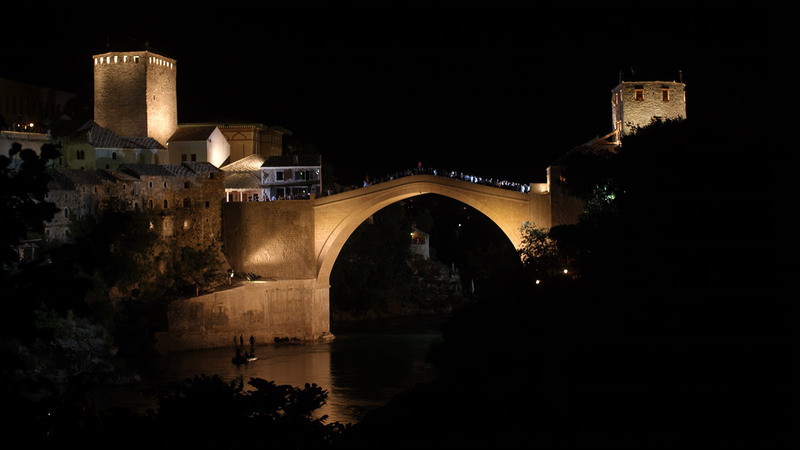 The relationship built between iGuzzini illuminazione and the renovation works committee began in the very first stages of the Mostar bridge renovation project. So the bridge's lighting project was also based on team work. The overall aim was to create a soft, homogeneous light effect, so low power luminaires were adopted. Maxiwoody floodlights were installed on both the buildings and the river banks with special louvers to avoid glare. The bridge's walking surface is lit with three halogen Woody luminaires fitted with anti-glare screens. As no electrical systems can be mounted on the bridge itself, these luminaires were mounted on the buildings at either end, which means the bridge is effectively floodlit. For the towers, on the other hand, and the other buildings at the ends of the bridge, Light Up Walk Professional luminaires with different power Wall Washer optics were installed. The streets and walkways in these areas are lit with 35 W Platea floodlights with a refractor glass to amplify the light beam. Miniwoody luminaires with refractors on the side of the window architrave were mounted on the windows of the Tara tower to illuminate the window frames, whereas Linealuce Xenon luminaires were chosen for the other windows in the area and Radius luminaires for the facades. Woody discharge floodlights were used for the general lighting. All the luminaires use metal halide lamps with a 3000 K colour temperature, but halogen lamps with a slightly warmer temperature (2800 K) were used for the inside of the tower windows to create a contrast.